And now it's time for silly songs with Larry... 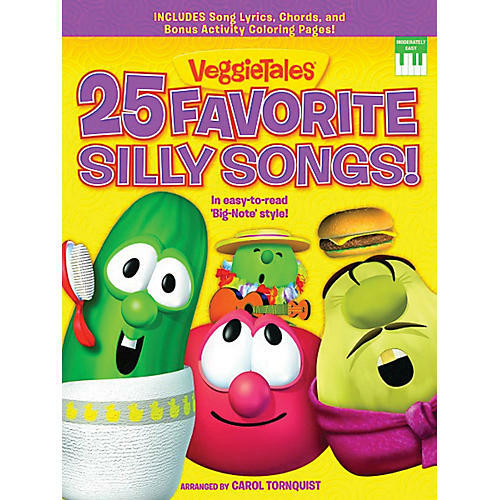 Here are 25 of the silliest from the matching CD by kids' favorite singing vegetables, the VeggieTales! This songbook features song lyrics with chords plus bonus activity coloring pages. Songs: Belly Button · The Dance of the Cucumber · Goodnight, Junior · The Hairbrush Song · Larry's Blues · Monkey · The Pirates Who Don't Do Anything · School House Polka · The Water Buffalo Song · and more, plus a bonus song: Happy Tooth Day.